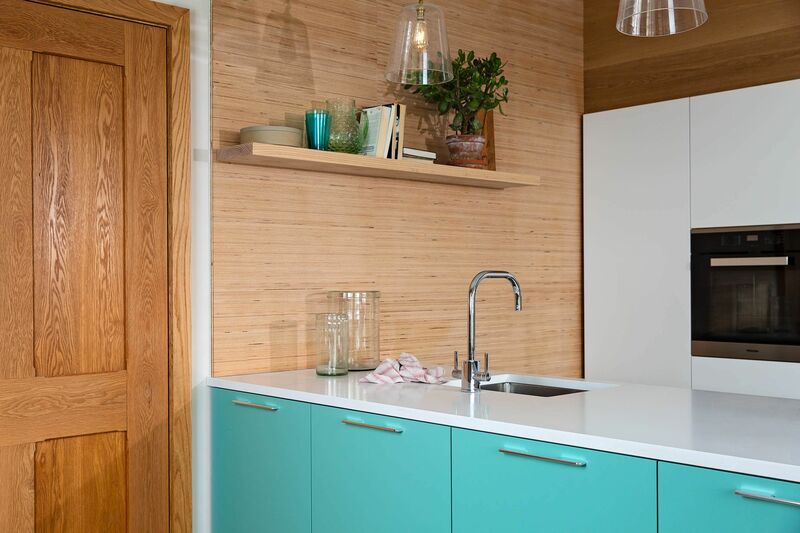 The Tower Bridge Kitchen is the latest addition to our Naked Doors portfolio. Inspired by our love of architecture and London, the Tower Bridge Kitchen is a beautifully minimalist kitchen design that really shows the beauty of the materials used at Naked Doors. We never compromise on the materials of our products, perfectly balancing form and function. With the ability to manufacture any type of door in any finish or colour, Naked Doors can create your dream kitchen, whatever your vision. The custom fronts we created for the Tower Bridge kitchen have a beautiful smooth finish. This helps to ensure the kitchen remains beautifully chic and sleek and maintains the clean lines throughout the design. 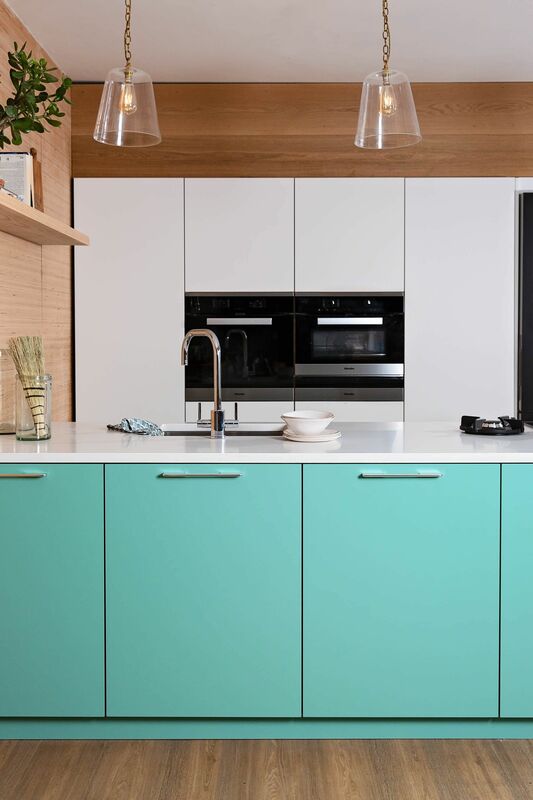 By using a slab door design without any visible grain, it helps the colour to stand out and draw the attention to the vibrant Arsenic painted doors. The slab doors are one of the most popular styles of doors, as they work in so many different environments. Finished in bright bold colours, these fronts can create the most contemporary feel, but finished with a neutral palette and combined with lots of beautiful timber and they can work beautifully in a much more traditional setting. By keeping accessories minimal, and the back row of doors push to open with no fussy handles, really helps to allow the beautiful colours to stand out. 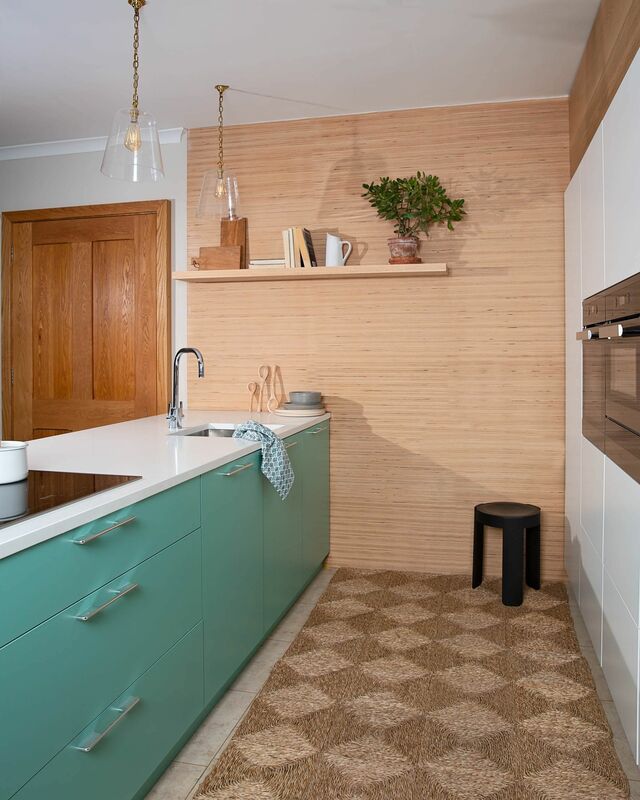 The design has an incredible scandinavian feel as it is so minimalist and sleek, and combined with the insanely cool ply panelled wall, such a natural beauty is created. 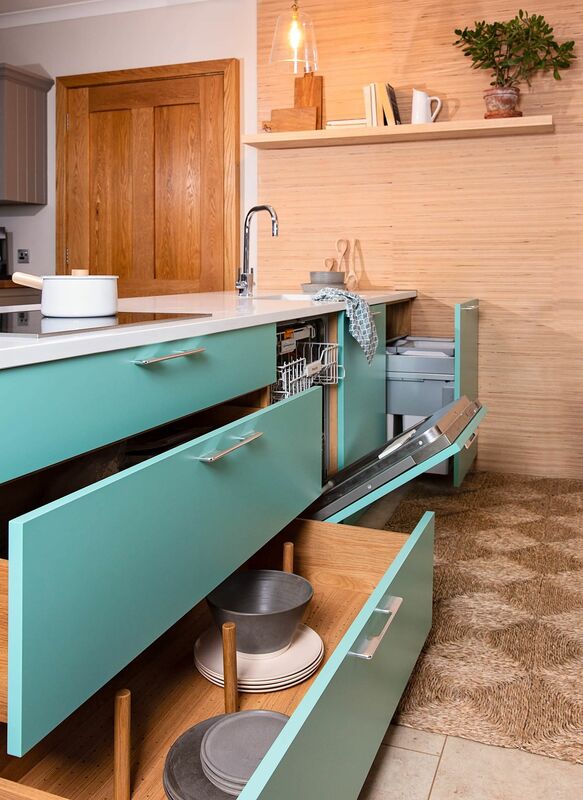 Not only is this an incredible way to see some of the beautiful materials we use, it also adds such an interesting feature to this very simple kitchen.